It is London in the late 1800’s and close to the turn of the century. Friday November 9, 1888 to be exact… You are a constable on night shift walking the streets of the Whitechapel district keeping the peace and watching over your section of town . You are armed with a small whistle and a club for your protection and to defend others. The London fog is thick and visibility is limited to a short distance. 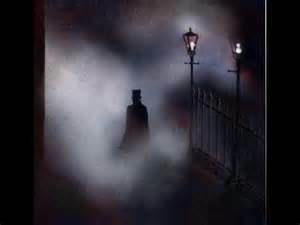 As you look up at the flickering gas street light, it causes eerie shadows to dance across your path. As you pull up your collar to the cold night air and step out onto the cobblestone streets, you have to watch your step. The dimly lit streets offer little help in guiding your way and most of the businesses along the main section of town have closed their doors, and turned out their lights for the night. There aren’t many people out and about at this time of night with only a few pubs open. As you round the corner you see a strange dim light off in the distance and hear a woman scream. You rush closer and see the few people that are left on the street begin to gather where the faint light once was. As you move closer, you see something huddled on the ground before you. Than you notice that it is the body of a woman who has been brutally murdered. Blood is oozing from the lacerations and onto the ground. You immediately begin blowing your whistle alerting other officers in the area that there is trouble. As the first officer arrives you send him to get the town doctor and you try to keep the small crowd back. By this time you notice the lights coming on at residences nearby and there are more people coming. A few more officers show up and shortly , everyone in the East End of London will know that Jack the Ripper has claimed his next victim. Her name was Mary Jane Kelly, and according to Scotland Yard she was his last victim. Jack the Ripper was also credited with 4 other murders prior to this one which all took place in a one mile radius in the London districts of Whitechapel, Spitalfields, Aldgate, and the city of London proper. Some believed he could have committed 4 or 5 other murders besides these, but it was never proven. The 4 murders he is credited with all took place in 1888 and ranged from Friday, August 31 to Friday, November 9 (all on weekends)… He was not the first serial killer, but probably the first to appear in a large metropolis among a thriving press and much political turmoil. For these reasons Jack the Ripper became both popular and somewhat romanticized. At the time there were no forensic science or fingerprinting and the only way to convict a murderer was to actually catch him or her in the act or get the suspect to confess. There were two police forces involved in the Ripper murders which were the London Police, and Scotland Yard. Other than taking statements and autopsies there was not much that could be done, so most people didn’t blame the local law enforcement. Actually local police took notes, drew diagrams and took pictures of the victims and crime scenes. However, Jack was never found out and the case was never solved. Even though there were several suspects, no one was ever arrested for the crimes, and Scotland Yard officially closed the case in 1892. Literature was beginning to thrive at that time and people were becoming interested in books and stories. Another memorable subject was born around this time. His name is Sherlock Holmes and he is remembered to this day. In fact lately there have been a few new movies about him appearing at the cinema, and countless movies, radio stories, and television series now and in the past. (I happen to be a huge fan.) Holmes was created by Sir Arthur Conan Doyle, and first appeared in print in 1887 (the year before the Ripper murders) and was featured in 4 novels and 56 short stories. The stories cover a period from about 1880 to 1914.The Holmes stories were also featured in 3 of the popular magazines circulating in London at the time, including Beeton’s Christmas Annual, Lippincott’s Monthly Magazine, and The Strand Magazine. His birthday (even though he is fictional), according to information in the stories is calculated to be January 6, 1854 and in 1881 Holmes had lodgings at 221 B Baker Street, London.